Method A. In this approach, the pyridyldithio group of the PDP is first reduced by a reducing agent (dithiothreitol, DTT). Maleimide-containing antibodies are then efficiently coupled to the surface of liposomes. The thiol-maleimide procedure is one of the most desirable reactions in bioconjugate chemistry due to its simplicity and high coupling efficiency in aqueous solution. The reaction, which is based on the stable thioether linkage between a thiol group (reduced form of PDP-liposome) and the corresponding maleimide group, occurs selectively and irreversibly at neutral pH (6.5-7.5), and the formed bonds are not cleaved by reducing agents. In addition, due to the presence of two different oxidation states of sulfur residues (oxidized and reduced states as a disulfide bond and sulfhydryl group, respectively) on the two conjugating components (i.e., the liposome and protein/antibody), the probability of the crosslinking of the homologous agents is low. Therefore, protein-protein and liposome-liposome crosslinking does not usually happen. Method B. Alternatively, the PDP group can participate in disulfide exchange reactions with thiols present on targeting proteins/antibodies. The coupling reaction is fast and conducted under mild conditions. However, the formed disulfide bonds have been reported to be less stable than thioether bonds. Moreover, even in an alkaline medium (pH 8.0), thiol groups are oxidized. The disulfide bond formed between the protein/antibody and liposomes can also be broken in the presence of a reducing agent and therefore, the conjugation reaction is reversible. Method A. Conjugation of maleimide-modified antibody to a PDP-modified liposome. Method B. Conjugation of a thiol-modified antibody to a PDP-modified liposome. Immunosome®-PDP is a non-PEGylated product. For the other reactive (PEGylated and non-PEGyalated products) Immunosome® products suitable for other types of conjugation method see here. Float-A-Lyzer® with a proper MWCO that easily allows the cleanup of your liposome conjugated ligand from free and non-conjugated protein/peptide/ligand. You need to make sure that the MWCO is below 1,000,000 dalton. At 1,000,000 dalton, the pore size on the dialysis membrane gets close to 100 nm and therefore your liposomes can be dialyzed out. You cannot use dialysis cassettes blindly. Please understand the technique before using either spin columns or dialysis cassettes. If you do not use the correct MWCO, you can lose your entire prep. For this protocol we recommend MWCO of 300,000 dalton. DL-dithiothreitol (DTT) (for method A). Ethylenediaminetetraacetic acid (EDTA) (for method B). The total lipid concentration in Immunosome®-PDP is 22.45 mM. 1% mol of the lipid in liposomes contains PDP group and only half of them are exposed to the outside of the liposomes, which is equal to 0.11 mM of reactive conjugable lipid. For 2 ml volume liposomes, this is equal to 2.20×10-7 mol, and for 5 ml volume liposomes, this is equal to 5.50×10-7 mol of PDP. To reduce the disulfide linkage, incubate the liposome containing PDP with DTT solution (liposome-PDP:DTT molar ratio of 1:250) to a final concentration of 20 mM for 30 min at room temperature. Separate DTT by passing the liposomes over a Sephadex® G-15 column eluted with 25 mM HEPES, 25 mM MES, 140 mM NaCl, pH 6.7 buffer. Immediately after removing DTT, incubate the thiolated liposomes with the maleimide-modified protein/antibody at a ligand:liposome molar ratio of 1:1000 (ligand:active lipid, 1:10 molar ratio) for overnight at room temperature. The free thiols on the liposome surface are blocked by incubation the suspension with iodoacetamide (0.2 mM) for 2 h at room temperature. The total lipid concentration in Immunosome®-PDP is 22.45 mM. 1% mol of the lipid in liposomes contains PDP group and only half of them are exposed to the outside of the liposomes, which is equal to 0.11 mM of reactive conjugable lipid. For 2 ml volume liposomes, this is equal to 2.20×10-7 mol, and for 5 ml volume liposomes, this is equal to 5.50×10-7 mol of PDP. Add the sulfhydryl-containing protein/antibody to PDP-liposome at 1:1000 molar ratio (ligand:active lipid, 1:10 molar ratio). In order to prevent metal-catalyzed oxidation of sulfhydryl, the reaction should be done in the presence of 10 mM EDTA. The pH is adjusted to 8.0 and the coupling reaction allowed to proceed overnight at room temperature with stirring under nitrogen or argon atmosphere to prevent lipid oxidation. The yield of conjugation is the most important factor in formulating immunoliposomes. Many scientists simply assume that their thiolated antibody or the Fab’ fraction contains reactive sulfhydryl for conjugation to maleimide lipid without further assay. Disulfide bridge can form very easily so it is very important to quantify the available reactive sulfhydryl in your antibody or ligand solution before performing the conjugation reaction with maleimide liposomes. 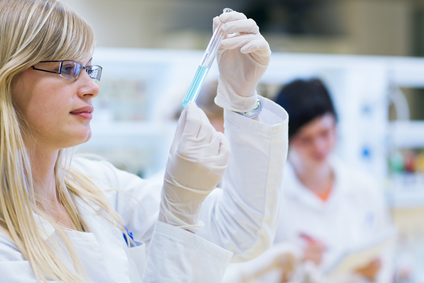 Ellman’s assay is a widely used assay for determining the amount of free sulfhydryl. You can follow the step by step protocol here. After conjugation reactions, liposomes containing excess maleimide or thiol groups may exhibit undesirable qualities, such as aggregation, reactions in vitro and in vivo, and immunogenicity. These reactive moieties can be quenched with reagents containing iodo-, maleimide, or sulfhydryl groups, where appropriate. This is likely to be a particularly serious problem for thiolated liposomes. Therefore, it is recommended that the antibody to be thiolated in order to generate the appropriate reactive entities for the final conjugation reaction. In order to prevent oxidation of sulfhydryl on antibody and formation of disulfide bridge, the coupling reaction must be performed under an inert atmosphere such as argon or nitrogen. To set up a inert gas chamber we recommend using Aldrich®-Atmosbag with is a flexible, inflatable polyethylene chamber with built-in gloves which is a portable and inexpensive alternative to laboratory glove box. Maleimide group on lipid is highly sensitive of alkaline pH and it will hydrolyze rapidly at higher pH. Experimental investigations have been shown that in alkaline condition (pH > 7.5), maleimide and its derivatives are hydrolyzed to a non-reactive maleamic acid (see the figure below). This instability should be considered in any quantitative procedures, such as coupling with sulfhydryl groups. Therefore, it is very important to make sure that the pH of the reaction with stay between 6.5 and 7 during the entire process. 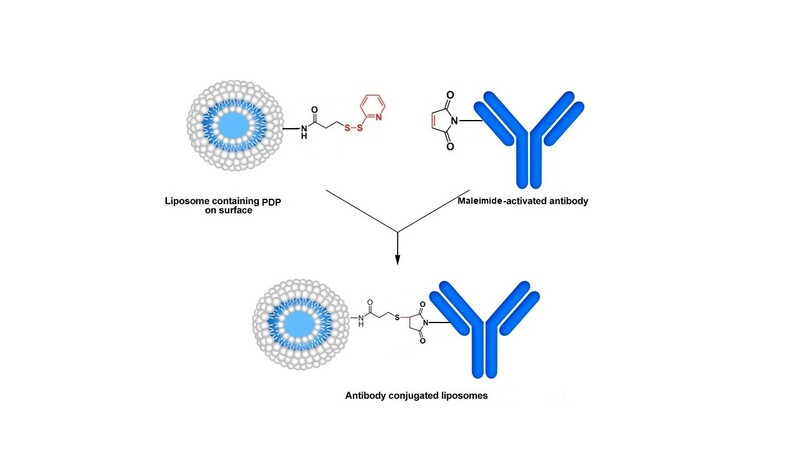 If your goal is to conjugate a thiolated protein/antibody containing reactive sulfhydryl to liposomes to form an immunoliposome, it is recommended to use liposomes containing maleimide reactive lipids. The amount of the maleimide-activated protein/antibody bound per liposome in Method A depends on the number of free thiols on the liposome surface (formed in step 1) and the reaction efficiency increases with increasing PDP/mAb molar ratio in the incubation mixture. If you are using a ligand or peptide that is hydrophobic then it is recommended to solubilize it in DMSO or DMF and then add the buffer to it. It is recommended not to use more than 5% volume of DMSO or DMF in the solution. DMF and DMSO are both compatible with liposomes and they are also miscible in water. Other organic solvent such as ethanol and chloroform are not compatible with liposomes and will cause the liposomes to lyse. If you end up using DMSO or DMF then after the conjugation reaction is done, you need to remove DMSO and DMF from the liposomes. In order to do that, you need to use a dialysis cassette that is made from REGENERATED CELLULOSE MEMBRANE. NOTE: Not all membranes are compatible with DMF and DMSO. We recommend using a Slide-A-Lyzer™ MINI Dialysis Device with MWCO of 2K made from regenerated cellulose membrane manufactured by ThermoFisher. After DMSO or DMF is removed you can use Float-A-Lyzer® dialysis device for the final step of cleaning up the prep. Immunosome®-PDP is a white translucent liquid made of nano size unilamellar liposomes. Usually due to the small size of liposomes no settling will occur in the bottom of the vial. The liposomes are packaged in an amber vial. 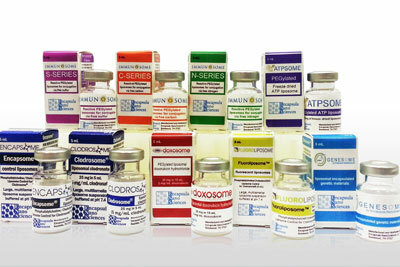 Immunosome®-PDP (Non-PEGylated) is made on daily basis. The batch that is shipped is manufactured on the same day. 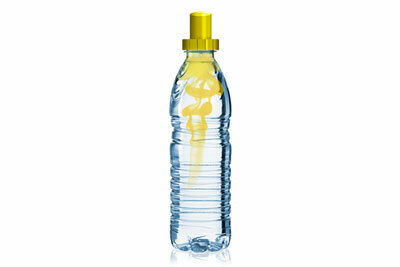 It is advised to use the products within 4 months of the manufacturing date. 1. Shi M, Lu J, Shoichet MS. Organic nanoscale drug carriers coupled with ligands for targeted drug delivery in cancer. Journal of Materials Chemistry. 2009;19(31):5485-98. 2. Mercadal M, Domingo JC, Petriz J, Garcia J, De Madariaga MA. A novel strategy affords high-yield coupling of antibody to extremities of liposomal surface-grafted PEG chains. Biochimica et Biophysica Acta (BBA)-Biomembranes. 1999 Apr 14;1418(1):232-8. 3. Bendas G, Krause A, Bakowsky U, Vogel J, Rothe U. Targetability of novel immunoliposomes prepared by a new antibody conjugation technique. International journal of pharmaceutics. 1999 Apr 20;181(1):79-93. 4. Allen TM, Brandeis E, Hansen CB, Kao GY, Zalipsky S. A new strategy for attachment of antibodies to sterically stabilized liposomes resulting in efficient targeting to cancer cells. Biochimica et Biophysica Acta (BBA)-Biomembranes. 1995 Jul 26;1237(2):99-108. 5. Martin FJ, Hubbell WL, Papahadjopoulos D. Immunospecific targeting of liposomes to cells: a novel and efficient method for covalent attachment of Fab’fragments via disulfide bonds. Biochemistry. 1981 Jul;20(14):4229-38. 6. Torchilin V, Weissig V. Liposomes: a practical approach. Oxford University Press; 2003 Jun 5. 7. Kim MJ, Lee HJ, Lee IA, Kim IY, Lim SK, Cho HA, Kim JS. Preparation of pH-sensitive, long-circulating and EGFR-targeted immunoliposomes. Archives of pharmacal research. 2008 Apr 1;31(4):539-46.